1856, a newly durable gold dollar was released by the Mint. 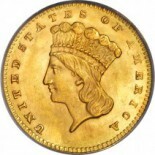 Dubbed “the Large Head type,” Longacre’s new design was very similar to that of the Small Head type, but the size of the Indian head on the obverse increased, while at the same time it became more flat. The headdress changed location as well, and the details of the face were slightly altered.